The Church formed in Canberra, Australia in 1980. Eight years and six albums later, the band released 'Starfish', which spawned their most successful single, 'Under the milky way'. It was written by the band's bassist Steve Kilbey and his then-girlfriend Karin Jansson. The single peaked at number 22 in Australia, and stayed in the US top 40 for several weeks. 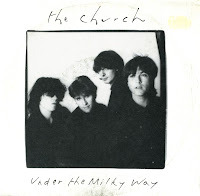 According to a press release issued with 'Starfish', the song was written about the Amsterdam music and cultural venue called De Melkweg (Dutch for 'Milky Way'), which Kilbey used to frequent. In the Dutch radio programme '2 meter sessies' the band performed an acoustic version which equalled this studio version, despite being totally different in instrumentation.